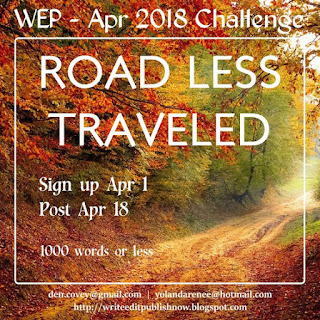 #WEPFF - The Road Less Traveled challenge winners! And we've added a new category! Despite it being the A-Z Challenge , 20 hardy souls took up the Road Less Traveled Challenge and entertained, inspired and made us cry. Thank you all! 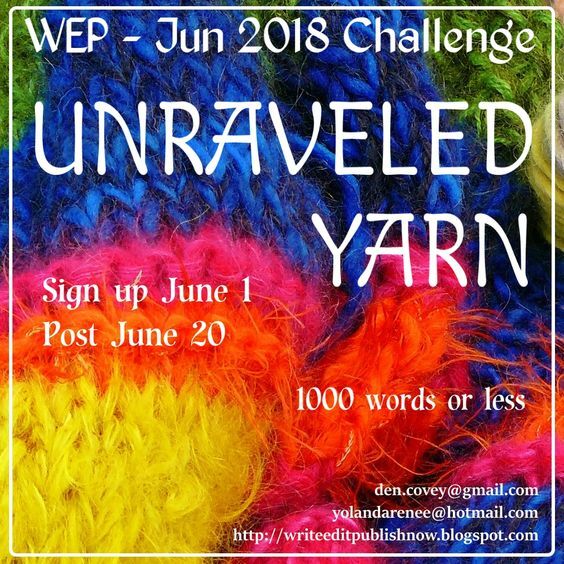 Before I get to the fun part, did you catch the WEP team's collaborative post for the A-Z challenge? It was so fun, bouncing off each other's stories to create an on-going story with a road sign as our prompt. If you haven't read it, go HERE. We'd love to hear what you think! The reading part of a WEP challenge is easy for the team, even if we have to go back several times for a re-read. Then comes the hard part. Choosing 3 outstanding entries. Often the writers who make the final cut tugged at us and stood out above the rest. Now that there's 4 of us on the team to have this discussion, coming to a final decision should be easier, but how we respond to writing is SO subjective. What floats one's boat, sinks another's. L.G. Keltner with her inspiring SPEECH. Desk49 with his personal POETRY. Carrie Golden with her heart-rending MEMOIR. Michael di Gesu with his super-fun MEMOIR. 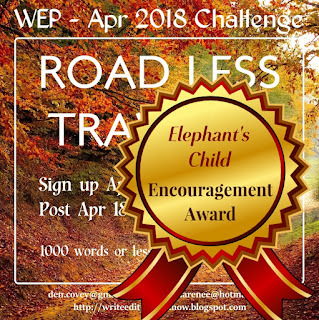 Elephant's Child with her awe-inspiring TRAVEL post. Kalpanaa with her tribute to Indira Ghandi. Right from the start, when the team came up with the idea of a Road Less Traveled, I LOVED it. This idea could take you anywhere. It resulted in some deep responses. Isn't that really the point of writing? To garner an emotional response in our readers. 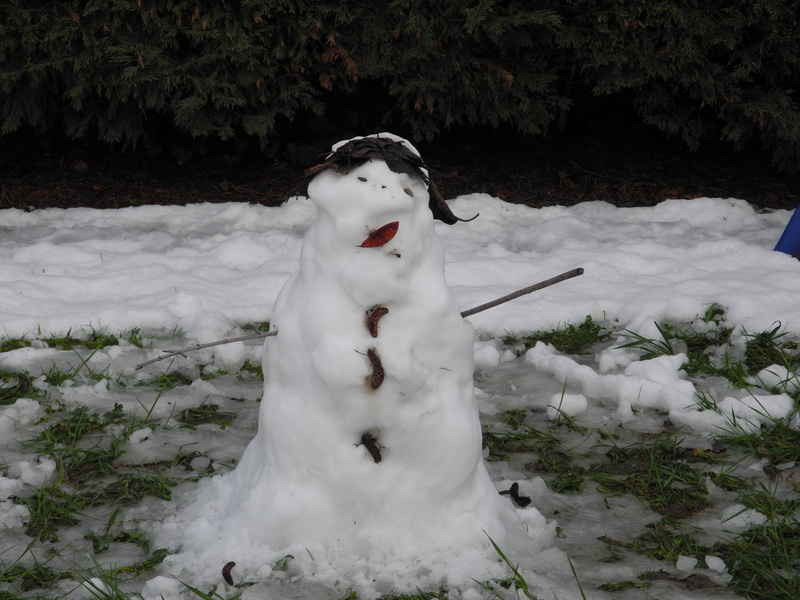 Here at WEP, we like being emotionally involved and that is what we were. Pat Garcia – Engaging, emotional as always. Pat's heroine was someone with insecurities most of us could sympathise with. Carrie Golden – reminded us that forgiving yourself is often the hardest thing to do in life. Christopher Scott introduced us to his speculative fiction, 'Raypunk' and told a gripping tale where readers asked for more. Pat Hatt – delivered with great panache another of his dark, nasty and extremely clever tales. Kalpanaa – through beautiful images, Kalpanaa reminded us of that inspirational lady, Indira Ghandi. DG Hudson– took us to Outpost Station #6, The Far Reaches, a riveting episode of sci-fi. Elephant's Child - Whoa, a trip to Antarctica, made more personal by her family's negative response to her once-in-a-lifetime-trip. J Lenni Dorner – the plot thickened in an on-going flash for the A - Z which fitted with the April WEP prompt. Donna McNichol - showed us what it can be like - this coming home. Roland Yeomans – through the Ghost of Carl Sagan, Roland bathed us in mystery. Michael di Gesu - introduced us to the memoir of Kay Hickman, written in such a way, the words bounced off the page. 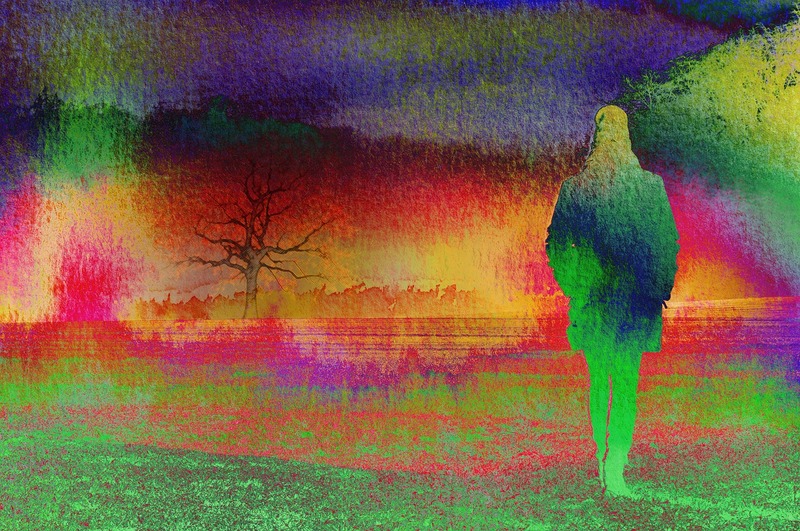 Deborah Drucker – showed us that loneliness can take us down a dark path. With its peek into a chapter from his coming memoir on the life of Kay Hickman, Michael dazzled us. 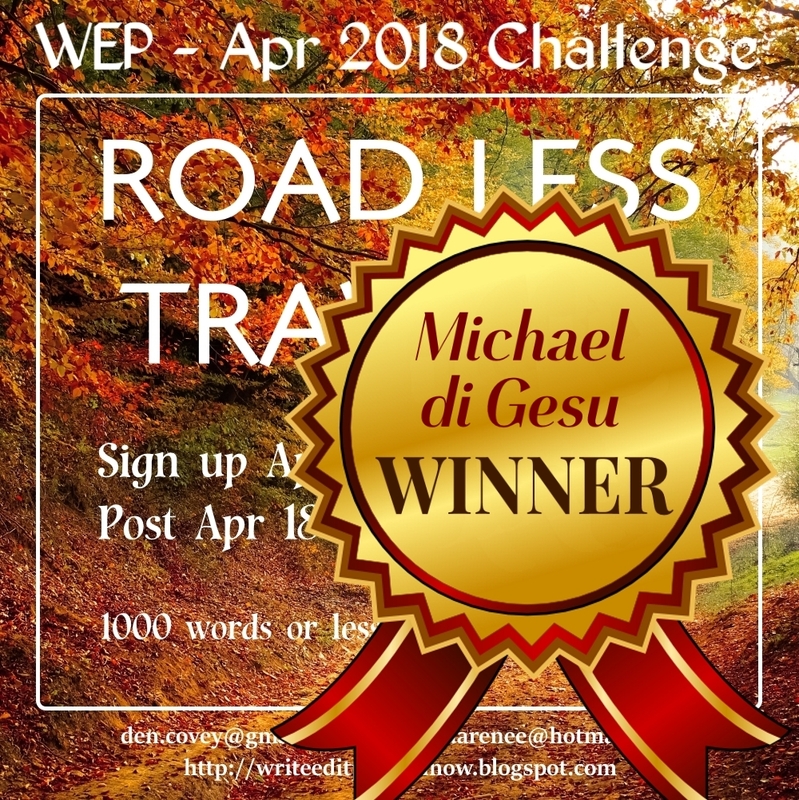 Please accept the winner's badge, Michael, and show it in your sidebar with a link to your story. Carrie's memoir on forgiveness was an inspiration to us all. Thank you for sharing with us, Carrie. 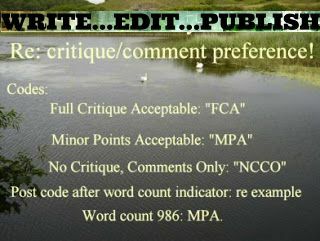 Please display the badge on your blog with a link to your post. 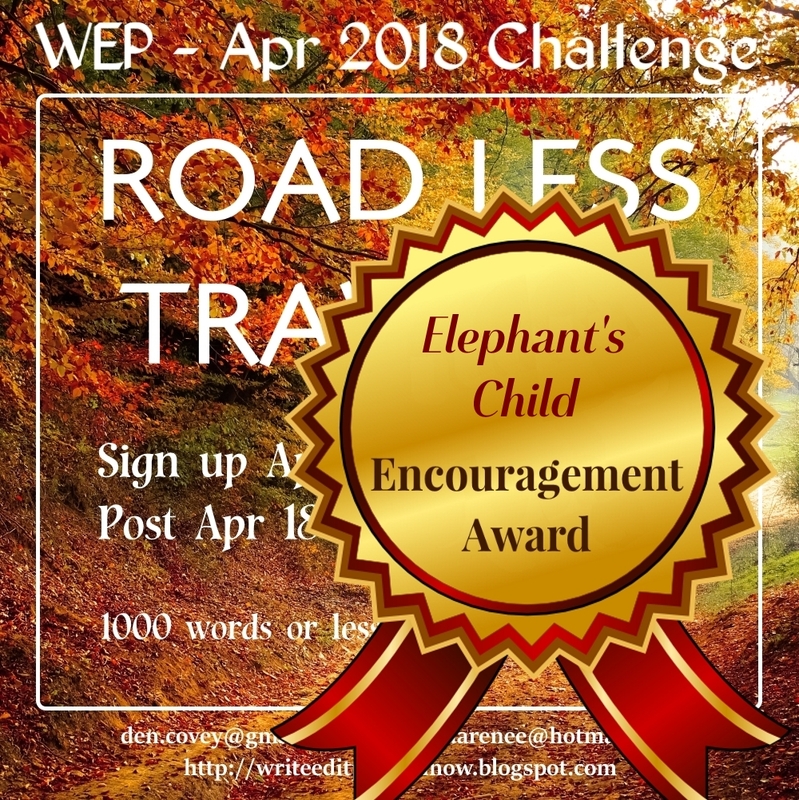 Elephant's Child, we loved your free verse with the title, Antarctica, and the beautiful original photographs which accompanied your entry. 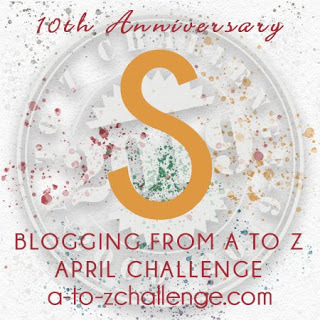 Please accept the badge and display it on your blog with a link to your entry. BREAKING NEWS! This month we have a new category which will be awarded at the team's discretion. All prospective winners are vetted for their comments before they are awarded a prize. Why? Because we need your comments. This is a supportive writing community where each person is valued. There are a handful of very strong commenters, on the other hand, so this award is created especially for them. 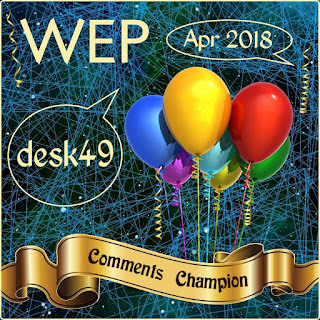 For the inaugural Commenting Champion Award, issued in April for the Road Less Traveled prompt, we acknowledge Desk49. He not only visits everyone, he comments in poetic form which takes real talent. Thank you, Ellis, Desk49. 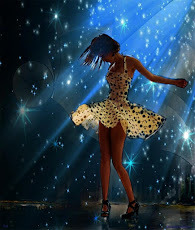 Please accept the badge and display on your blog to inspire all who come by! And as always, we thank our team member, Olga Godim, for the time and creativity she puts into our winners' badges. 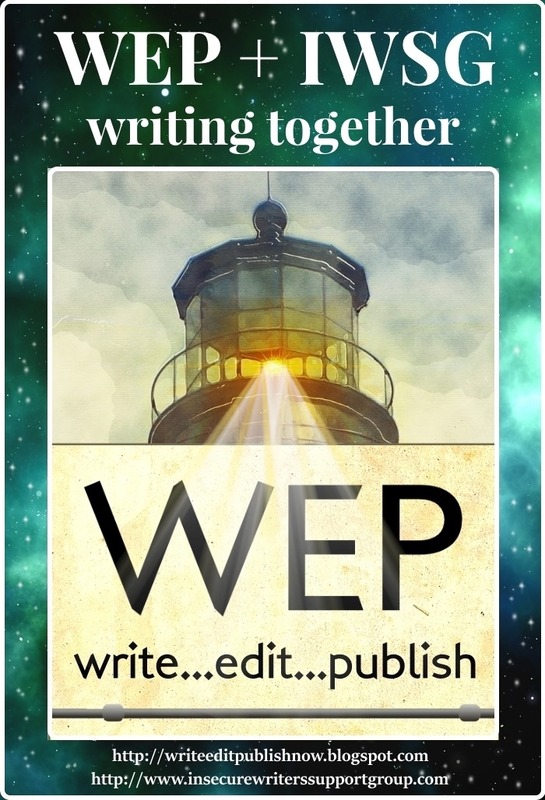 A NEW TIMEZONE: In future challenges, WEP will post to EST (East Coast USA) time. Check the clock at the top. 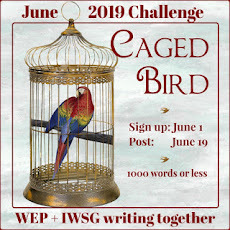 Please post your entry on or before the challenge date according to the clock. The linky will close at midnight at EST on the given date. This will enable the team to read, discuss and decide on winners within a shorter timeframe. Thanks! 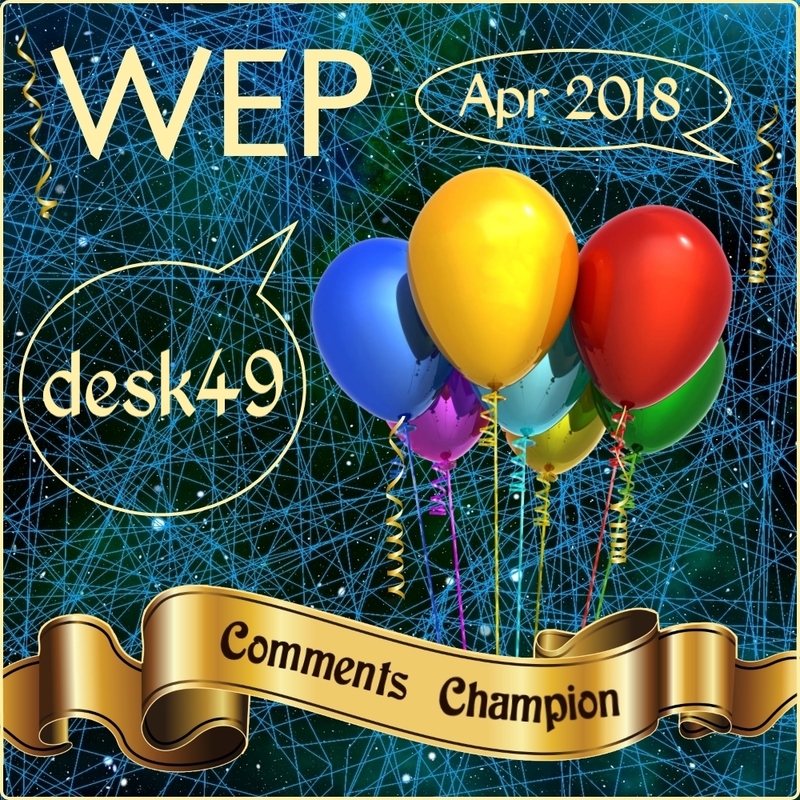 And if you find you can't comment on a post, due to blogspot or WP difficulties, advise one of the team or leave a comment on the WEP current post. Try to set up your comment system so it's easy to comment! Thanks, everyone, for joining us in APRIL. We appreciate each and every one of you. 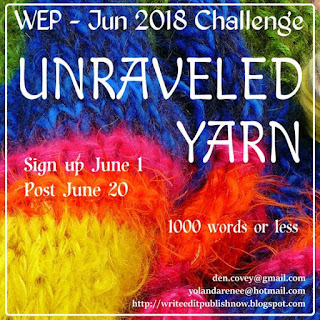 Our next Challenge will be in JUNE – UNRAVELED YARN! So what's it going to be? 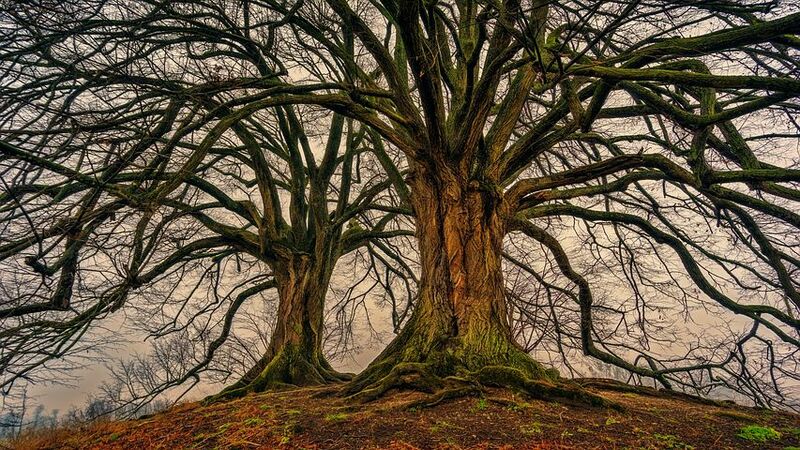 A tall story? An evil knitting lady/man plotting someone's demise (okay, Yolanda, this is for you!) Whatever pops into your mind, go with it! 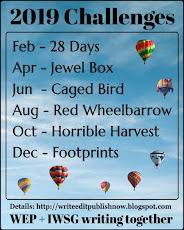 On the Challenges Page you’ll find the prompt schedule for the year and further inspiration for the next prompt. 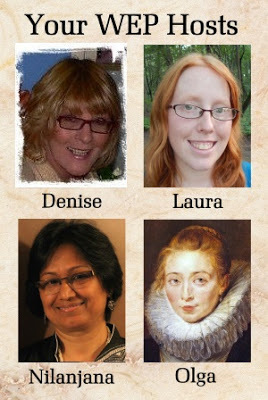 Be sure to return to read the winner’s guest post in a couple of weeks! Please click the social media buttons to share this post if you'd be so kind!